Screen Gems have released a poster for the upcoming movie Priest Paul Bettany, Cam Gigandet, Maggie Q, Karl Urban, Lily Collins, starring and Stephen Moyer. The film is due to hit theaters on May 13, 2011.Set 100 years from now after the war between Christians and Satanists, the film is about a Christian warrior priest [Bettany] who disobeys church law by teaming with a young sheriff [Gigandet] and a priestess [Maggie Q] to track down a cult of vampire outlaws that is led by a former Christian and now a Satanic priest, Black Hat, who kidnapped his niece before they brainwash her. 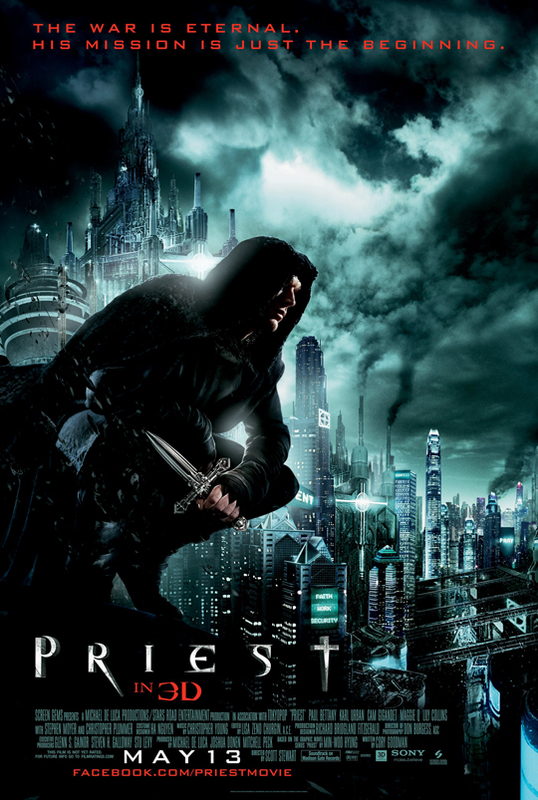 I'm reading: SCREEN GEMS RELEASE POSTER FOR HEAVY HITTING VAMPIRE FLICK [PRIEST] STARRING PAUL BETTANYTweet this!